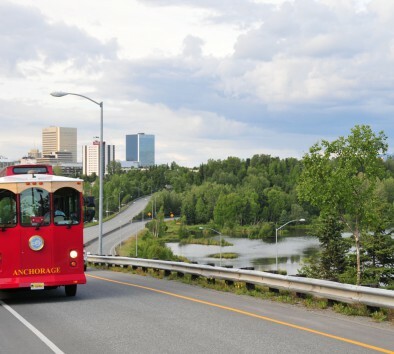 All aboard Anchorage’s favorite city tour! Hop on this historic and scenic 15-mile tour of Anchorage. Your Alaskan guides will share history, family stories and explore Anchorage’s past and present. From the most riveting moments of Anchorage’s yesterdays to present day living, your fully narrated trolley tours visit cultural and historical sites, watch seaplanes splash land on Lake Hood, hit scenic viewpoints with mountain and ocean views, and travel through Earthquake Park. Search for a sighting of our most famous resident—the mighty urban moose. Every step of the way, you’ll be guided by a team of local Alaskans who love sharing the heart and history of our town. Every ticket comes with a complimentary coupon book with over $100 worth of traveler savings. So, when you’re ready to get the “lay of the land,” or get off the beaten path, this tour is your best and finest place to begin your adventure in the Greatland! Tour does not depart from Anchorage hotels. Your pick up location is on 4th and “F” street (walking distance from the hotels) next to the Historic Log Cabin. Please arrive about 15 minutes before your tour starts to check in and get the best seats. Activity level: Easy.